35 minutes, it was only fitting to call this release an EP. Launching the A-side is, “Burners” featuring California rap pillar, Blu of Blu & Exile fame and Boston’s finest himself, Insight (Y Society). The three MC’s spark the mic in a charismatic lyrical exhibition showcasing distinct styles from each personality. Providing the track, Damu the Fudgemunk locks a tight groove fusing ambient atmospheric noises and worldly textures for 10 mins and counting with extended DJ solos. All 4 parties reach the top of their games on Burners and create a one of a kind sound for hip hop in 2018. The posse cut is complimented, by the crowd pleasing call & response anthem, “The Answer is Yes”. 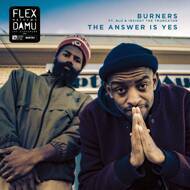 This time, Flex is joined on the mic by his DJ, Damu. The duo presents a confident and fun perspective into staying positive and living the good life. If the lyrics aren’t enough to captivate the audience, the chorus is sure to catch the listener by storm to prevail that “Yes” is the answer. Musically this selection covers all bases of a hit record. The beat combines flavors from the West coast G-Funk, jazz, East coast hip hop and Go-Go which has the power to appeal to many audiences. The two hope that the songs message will inspire the masses to do their best and have a great lifetime. Side B of the EP continues with full instrumental versions. Fans of Damu’s last solo album, Vignettes will recognize how the lengthy production and arrangements of these 2 tracks pick up where the style of Vignettes left off. Whether you want good good hip hop songs or craving an extended program of instrumentals, Flex Mathews and Damu the Fudgemunk’s EP is built to satisfy.